Without a fixture since Forres at the beginning of November, followed by two weather-caused postponements of the Torvean and Muir of Ord fixtures, the members of the North Scottish Golfers Alliance will be hoping the milder weather from the start of this week continues and they can get the second half of the season underway at Spey Bay on Saturday. 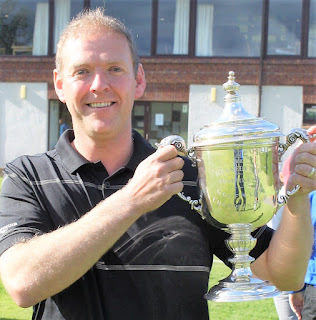 With just five fixtures played and only three members playing all five, David Joel (Inverness), Gordon Hay (Boat of Garten) and Inverness professional David Grindell they will be eager to get their mandatory sixth score recorded in the race for the end of season winning scratch aggregate total and lift the K M Cameron Cup. Joel (pictured with the Inverness club championship trophy), in fact will be an absentee from the Spey Bay field as he is off to Durham to attend his father’s 70th birthday party. With two scratch wins Joel leads by 14 strokes from Hay after his returns at Moray New (77), Grantown (65), Boat of Garten (65), Inverness (70), and Forres (72) for a total of 349. Hay's aggregate of 363 was recorded at Moray New (71), Grantown (70), Boat of Garten (75), Inverness (71) and Forres (76) while Grindell's five-score aggregate of 369 was compiled at Moray New (73), Grantown (74), Boat of Garten (72), Inverness (78) and Forres (72) for an aggregate of 369. After missing the first fixture at Moray New, Bruce Thomson (Inverness) leads the four-score totals to mount his challenge from on 285 (71, 68, 75, 71). He is ten ahead of Gordon Shaw (Boat of Garten) (76-72-74-73). Shaw missed the Inverness fixture. Gordon Hay (1) is also in contention for the low handicap nett aggregate Bill Burnett Trophy with a five-score nett total of 358, leading by seven from Neil McPhie (Inverness) (5). In the high handicap section last year's winner of the Bill McQueen Trophy, Torvean's Mike Lyall (10), is ahead after five scores for 349, 16 strokes in front of Jimmy MacDonald (Inverness) (16) 363. Other five-round totals are Colin Small The Nairn) 372, Aaron Casey (Moray) 375, Liam Hutcheon Inverness 376. Four-score leaders are Jim Rogers (Inverness) and Alan Boxx (Boat of Garten), both on 289. The fixture dates to the end of season championship at Nairn Dunbar on Saturday March 17 are: January 27, Spey Bay; February 3, Fortrose and Rosemarkie; February 10, Moray Old; February 17, Muir of Ord; February 24, Hopeman; March 3, Elgin; March 10, Garmouth; March 17, Nairn Dunbar.